What does it take to be the perfect princess ? 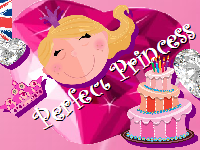 Within this party kit little girls are taken through the world of princesses, and discover what makes a perfect princess. From designing their own princess’s dress they are, themselves, transformed into princesses by a fantastic princess crown. The story of « The princess and the pea » paves the way to discover what makes a perfect princess, and they are tested in the « cushion game » to see if they are indeed ‘real, perfect princesses’. 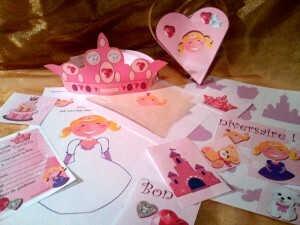 Together, they help the princess go to the ball, by finding all her things within the « Picture hunt game ». They then join her, dancing the night away at the ball. But, as with Cinderella, those perfect princesses will need to watch out for 12 o’clock in the « Midnight ball game », or they may lose their prince charming ! Finally, by helping the princess find her lost shoe, they are led to discover where their beautiful candy bags are hidden. All the children leave with their crowns, candy bags, colouring pages and the knowledge that they are all, indeed, ‘perfect princesses’ . A great party little girls will love ! Especially if they come in fancy-dress !